Lock in a great price for Regina Hotel – rated 8.5 by recent guests! Location was great. The owner was very kind. The room was cleaned every day. perfect location in town, but set back a couple blocks so you don't hear the noise from the port. The room had A/C, TV and a refrig. The hotel is run by very nice women. Greek breakfast in a charming courtyard. Will definitely return. The view from the apartment balcony is incredible. Its not a place for luxury but value for the money, if you are looking for a fancy place choose another hotel, if you are looking for a unexpensive accomodation this could be your choice. Great owner who looked after us at all times and helped with local recommendations. Tidy room and kept clean daily. Shower could have been wall mounted, but i think this is a European thing. Bed a bit hard, but comfortable. We had a room with 2 balconies, and was good as weasther was wet and one balcony was protected from the wind. Close to town centre, a couple of minutes walk. Hired a car to drive around the island and able to park nearby. All round a great stay. Late September is getting cold and shops starting to close down. Still restaurants open and less crowds. Lovely port and easy to get to the hotel once off the ferry. 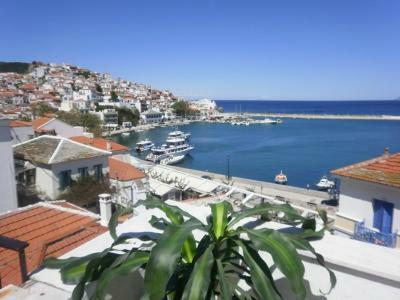 The hotel is located in the center of Skopelos, close to the old port and various traditional restaurants. Very clean room and nice hotel keeper. Fantastic location. We needed a hotel for two nights, so glad we chose this. Comfortable, clean, nice hot shower, a gorgeous balcony and in the centre of town. The property was great value for money and in a very central location. Regina Hotel This rating is a reflection of how the property compares to the industry standard when it comes to price, facilities and services available. It's based on a self-evaluation by the property. Use this rating to help choose your stay! 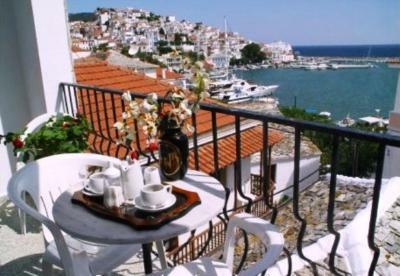 Overlooking the port of Skopelos, Regina is a family-run hotel offering air conditioned rooms with balcony. Within walking distance, guests can reach the local market, restaurants and a bus stop. The rooms in Regina Hotel are equipped with a TV and refrigerator. They all have a balcony, while some also enjoy partial views of the Aegean Sea. Guests can enjoy their breakfast either in the dining room of the hotel featuring a TV or in the privacy of their room. 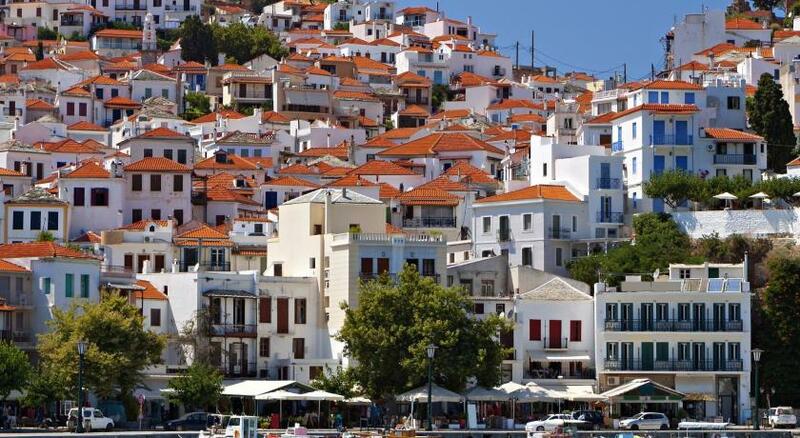 The seaside road and the port of Skopelos are just 150 feet from Regina. The lovely Stafylos beach is less than 3 miles away. Free parking is available near the premises. When would you like to stay at Regina Hotel? This apartment comes with 1 single bed and 2 double beds or 2 single beds and 1 double bed. House Rules Regina Hotel takes special requests – add in the next step! Regina Hotel accepts these cards and reserves the right to temporarily hold an amount prior to arrival. Stairs, but it is a Greek island. Hard bed, but comfortable. Nothing else . Way too pricey for the room, although it seems to be something usual in the island. Our room was quite small and basic but we were OK with that as we didn’t want to climb the stairs to the bigger room. The location, incredibly close to the port and bus station, was very useful both on my arrival and departure day and during my whole stay as I used to take the local bus every morning to the beaches located on the other side of the island. There are also bakery shops, tavernas, supermarkets very close to the hotel which is very helpful. The hotel itself is situated in quite a cosy area, surrounded by locals' houses with great view from our room over the town residences spreading up the hills. Vintage furniture in the lobby and a lovely interior little garden where you can take breakfast in the morning. I also enjoyed having dinner every day on the balcony and we had the possibilty to dry our towels. the staff, the decor and location. The hospitality and welcoming was amazing. I travel a lot and I felt at home. The staff, Vicki and Maria were lovely, they even washed my clothes for me. Breakfast is as great( also I slept throughout breakfast time) it was great 2 mins to the old town and to the ferry was literally 5 minutes away. I’m definately coming back year. Not being able to pay by card. Location is great. A very traditional hotel with a good host. The price was low and value for money. What's not to like? Great value for money. Close to the harbour. Comfortable, quiet and so friendly....even Greek lessons, each time I left and arrived!